This feature is available only to those users who are managing more than one store on their systems - e.g. if you have a general store for holding stock, and you supply a dispensary with their day to day needs - see Virtual stores. There must be more than one store set up in your copy of mSupply. You must have the user permission to perform transfers. The store you're transferring to must be visible. To make it visible choose Special > Show stores and double-click the store you want to transfer to, then on the preferences tab click the View name button and set the visibility on the Stores tab. This procedure follows closely the steps as described under Issuing Goods to a Customer (Customer Invoices); to avoid unnecessary repetition, please make sure you are familiar with that procedure. Stock transfer label (under comment field) defines that the goods being issued are for a store. not for a customer. The procedure from this point is identical to that described under Issuing Goods to a Customer (Customer Invoices). It is necessary to finalise the transfer when you have finished entering the items to be transferred. Only after finalising the transfer will the new invoice appear on the system, as a supplier invoice in the receiving store, linked to the customer invoice in the issuing store. The status of the supplier invoice in the receiving store will either be confirmed and on hold or finalised, according to the setting you have for the “For stock transfers, the supplier invoice in the receiving store should be…” store preference. See here for details. If the item(s) you are transferring are not visible in the receiving store the following message will appear: Check whether there is any reason for the item(s) in question not to be visible in the destination store. If there is no reason to prevent visibility click OK. If you are running a syncing system (see Remote Synchronisation) and the receiving store is active on another site, the receiving site will send back a confirmation log message to confirm that it has received the transfer. This will show up in the Log tab of the sending customer invoice. On a syncing system, the sending site does not have access to the item visibility records in the receiving store if it is a transfer store, so it cannot do the item visibility check above. In this case, the primary server will automatically make the items visible in the receiving store when it receives the transfer. Should a reversal of a stock transfer be necessary, this may be achieved by the operator at the sending store, and only if the receiving store has not issued any of the transferred stock. In the customer store a Supplier Invoice will be automatically generated, provided that the Customer Invoice in the sending store was finalised - see above! You can view the customer invoice record via the Suppliers tab on the Navigator or via the Supplier > Show invoices… menu item. 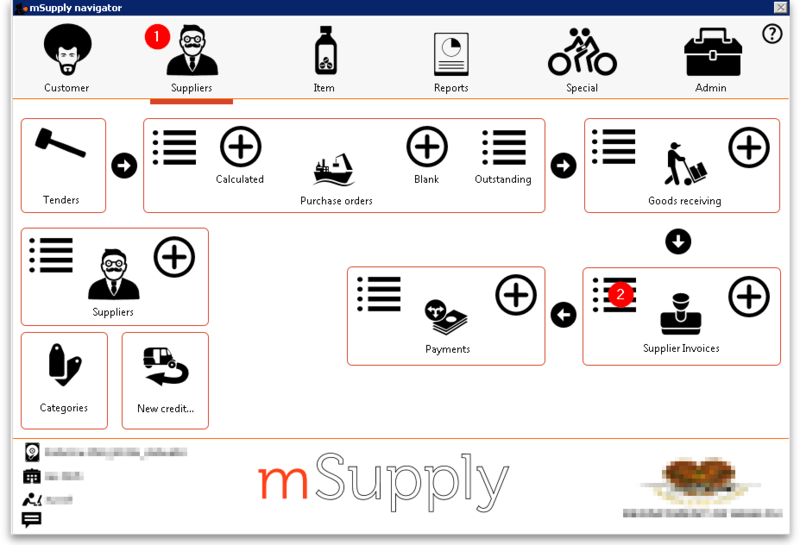 On the supplier invoice the lines from the customer invoice will have been filled in automatically. Depending on your store preferences, this customer invoice may or may not be locked, or finalised.